Sponsored by J.Stern & Co. The Lost Treasures of Strawberry Hill: Masterpieces from Horace Walpole’s collection, ran from the 20 October 2018 – 24 February 2019. Over 150 objects from Horace Walpole’s famous and unique collection were reunited in the house for this once-in-a-lifetime exhibition. Horace Walpole’s collection was one of the most important of the 18th century. It was dispersed in a great sale in 1842. For the first time in over 170 years, Strawberry Hill House was seen as Walpole had conceived it, with the collection in the interiors as he designed it, shown in their original positions. Missed the Lost Treasures of Strawberry Hill exhibition? 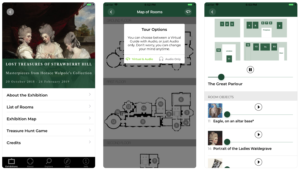 Download our free interactive app! Explore Horace Walpole’s collection with a virtual tour of the Lost Treasures of Strawberry Hill exhibition. The app is free to download for both ISO and Android phones. Strawberry Hill was filled with a celebrated collection of paintings, furniture, sculptures and curiosities: great portraits by Sir Joshua Reynolds, Sir Peter Lely, Allan Ramsay, Rubens, Van Dyck, Hans Holbein and Clouet; miniature portraits by Isaac and Peter Oliver, Hilliard and Petitot, a carved Roman eagle from the 1st century AD; fine furniture including a Boulle cabinet, fabulous Sèvres pieces as well as some oddities such as a lime-wood cravat, carved by Grinling Gibbons, a lock of Mary Tudor’s hair and a ‘magic mirror’ (an obsidian disc) which Dr Dee, Queen Elizabeth I’s necromancer, had used for conjuring up the spirits. In 1842, the collection was dispersed worldwide in a 28 day ‘sale of the century’. From the 1920s to the ‘70s, Walpole scholar and consummate collector Wilmarth S. Lewis, who edited and published with Yale University Press the 48-volume Yale Edition of Horace Walpole’s Correspondence (New Haven, 1937-1983), assembled the largest private collection of Walpoliana, including many pieces from Strawberry Hill, which he and his wife bequeathed to Yale University in 1980 as the Lewis Walpole Library, with whose help the Strawberry Hill Trust is delighted to be mounting this exhibition. Walpole left detailed descriptions of the displays in each of the main rooms of his villa, so that nearly all the works can be shown in their original positions. 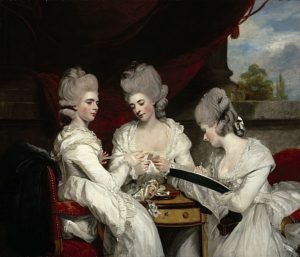 In The Great Parlour, a display of portraits of Walpole’s family includes the famous Reynolds’ painting of Walpole’s nieces, The Ladies Waldegrave, (now in the National Gallery of Scotland). The Tribune will house the famous rosewood cabinet designed by Walpole, owned by the V&A, together with a display of exquisite portrait miniatures. Walpole’s gilded, crimson Gallery will be once again house the impressive Roman sculpture of an eagle and be hung with life-size portraits, including The Family of Catherine de Medici by Clouet. A richly illustrated book about Walpole and his collections, written by Co-Curator Silvia Davoli accompanies the exhibition. Published by Scala (price £15) it is available in the Strawberry Hill shop throughout the exhibition. Co-Curator, Dr Silvia Davoli and Michael Snodin, Hon Curator and Chair of Strawberry Hill Collection Trust, have undertaken a major treasure hunt for Walpole’s collection, which has led to the discovery of Walpole objects across the world. 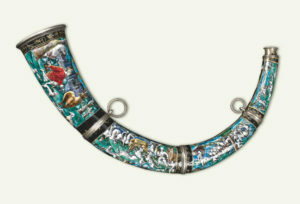 To date, 200 more objects have been found in public museums and private collections from London to New York to Moscow. In many cases the owners were unaware of the Strawberry Hill provenance. Discoveries include renaissance paintings and drawings, works by Rubens and Van Dyck, an ancient Roman fresco and a sarcophagus. There are many significant objects still at large and the search continues with an interactive Treasure Hunt Blog. Strawberry Hill Treasure Hunt Blog, in partnership with Boodle Hatfield, solicitors. Portrait of the Ladies Waldegrave, Joshua Reynolds (1723-1792), 1780-81, oil on canvas, 143 x 16 8.3 cm © The Ladies Waldegrave, Sir Joshua Reynolds, National Galleries of Scotland. Edinburgh. Purchased with the aid of The Cowan Smith Bequest and the Art Fund 1952. Portrait of a young man as a shepherd (portrait of Abraham Cowley) Peter Lely (1618-1680), oil on canvas, 91.4 x 75.6 cm, The Dulwich Picture Gallery, London (DPG563/1911) © By Permission of Dulwich Picture Gallery, London. Johann Heinrich Müntz, ‘Strawberry Hill’ c. 1755-79. Courtesy of the Lewis Walpole Library, Yale University.